Produced as part of Peter Coppin's graduate MFA thesis project (with Alexi Morrissey) in the Electronic and Time-Based Media Program at Carnegie Mellon, and exhibited nationally and internationally, including Prix Ars Electronica 1998, under the group alias "Centre for Metahuman Exploration" (specific credits for all collaborators are below). Project Paradise was a telepresence installation that enabled two separated users to remotely interact with each other via a cyborg "Adam" or "Eve" within a remote "paradise". Each participant could control the body of a cyborg to engage in interaction with the other isolated user. A user teleoperating Cyborg Adam in order to remotely touch Cyborg Eve, a surrogate representing another gallery attendee. A user teleoperating Cyborg Eve in order to remotely touch Cyborg Adam, a surrogate representing another gallery attendee. Audience members remotely interacted with each other by teleoperating Cyborg Adam and Eve. 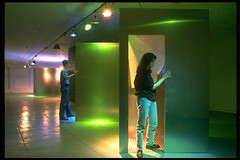 The installation consisted of two "hi-tech" aluminum isolation "phone booths" and a cylindrical chamber connected by video and telephone cabling. Each isolation booth contained the interface to "paradise": a television and a telephone. Telephone button presses allowed users to "be Adam or Eve in paradise." This "Paradise" could only be experienced through telepresence via the robotically augented human actors (cyborgs). Through these "Cyborg Surrogate Selves", participants could "touch" the grass, the flowers, and the flesh. 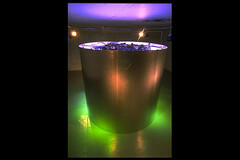 The cylindrical aluminum chamber located elsewhere in the installation contained a lush, plant-filled "paradise" and two robotically-augmented actors: the Cyborg Adam and Eve.